The capabilities of Google Earth should terrify you. Input an address, any address, in this website and the location pops up in all its 3-D glory. Your vehicles may show up, your backyard with its playset, even, possibly, you in the pool or sunbathing. Without a doubt, Google’s intrusion on our privacy is just beginning. This article provides more in-depth information as to what Google Maps and Google Earth are capable of. On a whim, I decided to turn the tables on Google Earth, just a bit, and use it for my own purposes. I pulled up our address on Google Earth, and took several screenshots — one of our entire town, a few of my general neighborhood, then a couple of my street, and 2 very close shots of my home, with the idea of using these screenshots to help with my prepping and planning. Once I created these screenshots, I went to work to figure out how I could best secure and prep my home and our property. This turned out to be an eye-opening experience, and I highly recommend you do the same, as I explain in this article. 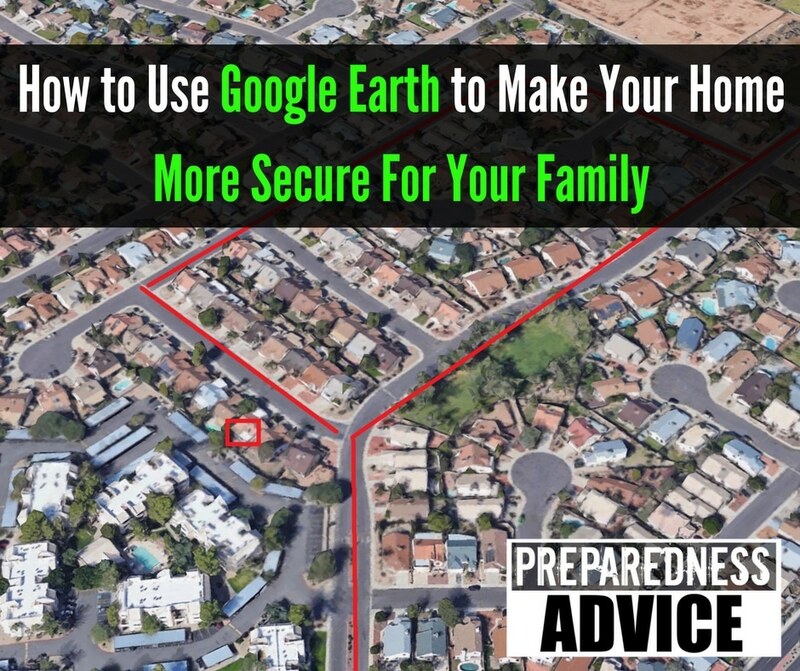 For the purpose of this article, I selected a general area in Glendale, Arizona, to illustrate this process as I put Google Earth to work to help with my home security and prepping plans. First, grab some screenshots that provide a broad overview of your town, showing highways and other large features. I can easily see at a glance all major highways and thoroughfares, as well as locations that tend to bring in a lot of traffic, such as churches, a college, sports arenas, a large city park, etc. Glendale, Arizona, is in a desert, so there are no lakes, rivers, dams, bridges, or other features that might have security implications. This screenshot is valuable in the insights it provides for planning evacuations. In this next screenshot, you get an idea of how difficult, and futile, it would be to try and evacuate should a worst case scenario occur. Unless you live on the far outskirts of this massive city, you can kiss your rear end goodbye — you ain’t goin’ nowhere. If traffic on the very few highways doesn’t kill you, then the miles of surrounding desert will. In the photo above, imagine that just 30% of the population realizes the need to evacuate. In the screenshot of your own town, take one street at a time, and mark every third house. After just 3 or 4 streets, you’ll soon realize the difficulties with any evacuation. The sheer number of people on the road, even less than 30%, will be staggering in a city the size of the greater Phoenix area. In the second screenshot, how many routes out of town do you see? There’s I-10, heading east/west, I-17, heading north and south, the 101 loop, that kind of goes nowhere you’d want to go in a major crisis, and then the 51 that meanders through the northern part of Phoenix, again, offering no real escape route. Take a couple of similar screenshots of your own town. What obvious routes in and out do you see? If you were a terrorist or some other really bad guy, how quickly could you block traffic both in and out of your town or neighborhood? If you aren’t surrounded by impassable deserts, what other natural features might offer challenges? Answers to these questions become more obvious when viewed from many thousands of feet above earth. Thank you, Google Earth! This view is where Google Earth really pays off, because now I can identify more specific potential threats as well as sources of help. This neighborhood is similar to one my family lived in (same area), and I’m highlighting the house in the large red box for training purposes, as they say. Let’s review this map using the letter markings I’ve placed in a few key locations. A: This marks the closest major highway, Loop 101. This is usually the fastest way to get out of town from this point but in a catastrophic event, the highway will shut down in less than 10 minutes. Sheer numbers of people, vehicle accidents, vehicle breakdowns — it’s just not a viable route out of town, unless I’m in front of the very first wave. A while back, I wrote this article about the importance of being in the first wave, and it would be good to review that information now. B: In the case of this particular neighborhood, there’s a large park to the northeast. That park could become home to vagrants, but it could also become a neighborhood garden or meeting place. Unfortunately, there is no natural water source here as there would be in other parts of the country. In your own Google Earth screenshots, look for natural water features. C: From the central point of this home, there are 2 possible directions for leaving the driveway. Pulling back a bit, you can see that leaving the neighborhood isn’t all that easy. If this were my house, I could go to the right and quickly get on a street that would get me out of the neighboorhood. Perhaps not to safety, but at least out of the immediate area. If I turn left from this driveway, I have to take the long way around, and if the emergency is happening in real time, how many others will be pulling out of their driveaways with the same thought in mind. Again, think about that 30% of people knowing, or being able, to evacuate. Just in this very small segment of a town, that is a LOT of people! Here is where having a few alternate forms of transportation comes in handy. Bicycles could be passed over a fence or wall, allowing for a quick exit. Motorcyles, street bikes, and even hoofing it out on foot — take all those options into consideration when looking for best evacuation routes. By the way, this book about emergency evacuations has some of the most helpful and most specific information I’ve found on the subject. D: I marked a cul-de-sac because these are very common features in neighborhoods. They are desirable for many reasons, but in an evacuation, you could become trapped. It’s also important to know where those cul-de-sacs are, so you don’t inadvertently make a turn into one, ending up in a dead end. E: This house has an apartment complex immediately behind it. I used to live in an apartment and bear no ill will toward anyone who does, but the fact that apartments are points of high density population increases the potential that criminal types of one form or another could be on the other side of this backyard fence. As well, in a food or water shortage, the obvious source of anything necessary to survival are the homes immediately surrounding the apartment complex. 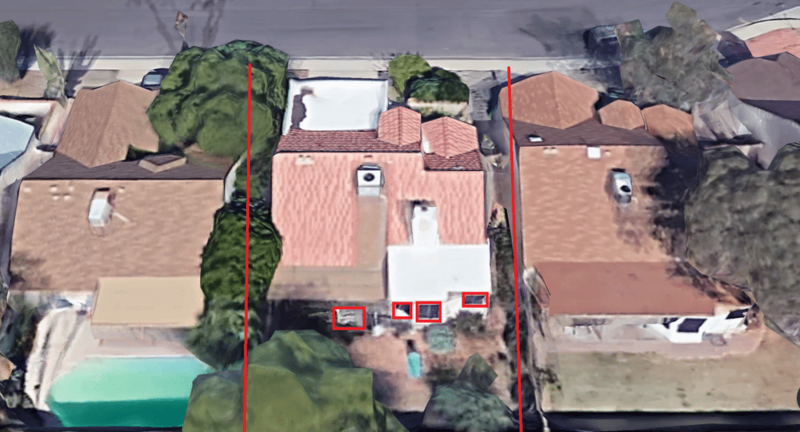 One other notation I made on Screenshot #3 are red stars highlighting the homes and neighbors that I knew well and/or figured I could possibly count on in an emergency. Using another past neighborhood I lived in, the house to the left is home to a very preparedness-minded Mormon family my kids were friends with, and to the right, was a couple in their 50’s, very active in the shooting sports and also prepper-minded. Due to my keen observation skills, I happen to know that the house on the far left corner is home to a retired member of the U.S. Army — the dead giveaway being the ARMY t-shirt he wears when he mows the lawn. Across the street are 2 former policemen. Now, there’s no way to know FOR SURE how anyone will react in a severe crisis, including myself, but by getting to know neighbors and just watching for signs of homes/individuals that have military or law-enforcement careers (past or present) as well as various tradespeople (such as the electric company lineman who lives on the next street), it’s all very helpful information to have. Your next screenshot should be one that encompasses your own street as well as a handful of streets on all sides. Make a note of “friendlies” and, in some cases, “hostiles” — people you already know will cause problems in the aftermath of a major natural disaster or, God forbid, a longterm power outage. It’s better to be aware of this possibility than to let your guard down and become too trusting. With this screenshot, also look for entrances to your neighborhood. How many ways could someone in a vehicle or on foot, get access to your neighborhood or your street? What could you do to prevent entry to your property or, at least, slow them down? In this screenshot, I’ve isolated the target home and noted windows, doors, and a couple of problem areas. To the left are massive trees and bushes that provide handy cover for intruders. In the hot Arizona sun, they also provide some shade to that side of the house, so if I lived here, I’d have to decide whether or not to trim the trees, cut them down, or enjoy the shade. Another issue is the obvious lack of space between houses. A group of criminals could easily move from one house to the next, stealing, vandalizing, etc. Would it be possible to raise the height of these 2 block fences or take some other measure to discourage any invaders from entering the property, such as planting rose bushes or cacti? This view is helpful when planning a home fire evacuation with the kids. Pull up this view on Google Earth and show them exactly where they should exit and where the family meeting point will be. 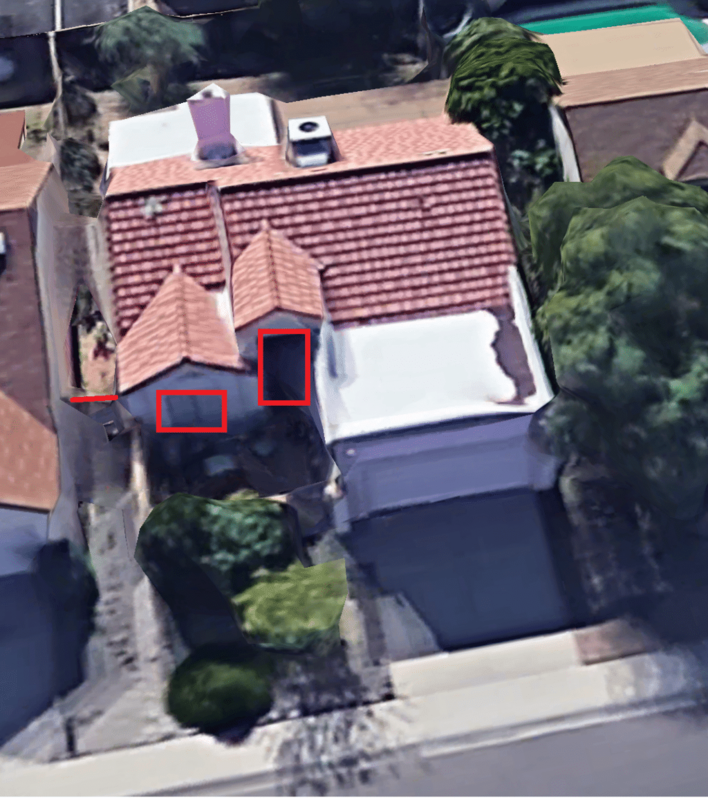 It’s easy to maneuver the Google Earth screen to focus on the front of a house or property, the back, even the sides, and I encourage you to do that in order to look for other security issues, in particular. If this house was on a bigger piece of land, I could also look for best locations for outbuildings, a garden, fruit trees, etc. One of the reasons I wanted to move my family from the Phoenix area is depicted in Screenshot #2 — the massive deserts surrounding the city, the high density population, obvious lack of natural water sources, and the very few roads leading out of the city. However, none of us live in an ideal location. Our current town was devasted by floods following Hurricane Harvey in August, 2017. Although we have plenty of natural water sources now, they present their own challenges. Your living situation is probably different — perhaps mountains with only a few roads passing through, miles of flat terrain, high-density population centers, swamps, you name it. Using Google Earth maps will show features and challenges you might not know exist. I highly recommend using Google Earth to analyze your own prepping and security challenges. Are there any strategies I overlooked? UPDATE: After posting this, I realized that I need to go through these same steps with my workplace location — identifying safe areas for evacuation, routes home, etc. I suggest you do the same for yourself and any loved ones who work away from home or go to school. This entry was posted in bugging out, emergencies, security and tagged evacuation, home defense, Maps, security, traffic, transportation. Bookmark the permalink. There’s also a ruler icon up at the top, at least it’s on the lap top computer, that I use to check the vegetation clearance on my property. Great info. May I share with my family? Sure! Feel free to share the link. This was really helpful. I had done this before but missed several aspects you highlighted. My family is living in a “almost impossible evactuation area.” Just minor fender binders, a little rain, etc. and the roads are totally blocked within one hour! Luckly I recently retired and am relocating to OKlahoma. Not totally ideal, but with many more options and resource availabilty. Its smart to live in a less populated area but not very practical for alot of us. Good luck to everyone. America Great Again!!! this site need to be print friendly. Don’t forget that you can download maps offline to mobile devices. Save them for a rainy day, and show your family too. Really well thought thru ideas here! And I think if a person could try the different routes discovered ahead of time would be valuable too. Wierdly enough, I tend to use quite a few different routes to get home from my office in Mpls 40 miles away, especially on Thurs/Fri afternoons in warm weather: big highways are gridlocked after about 3 p.m. as people head north to go to cabins/lakes. Then, let’s not forget about our summer long road work and resultant delays! I don’t even want to imagine what it’d be like during an evacuation here…of course, I also wonder where the heck they’d ‘evacuate’ to?…I think the bike idea is excellent. My sis has a foldable bike that fits easily in her trunk, but while she is very familiar with her area, once she got out of city, to most likely come to my place, I know she doesn’t know my many cut-thru’s. (Notice I don’t say short-cuts.) Think I will tell her to print out Google maps, keep in her car.